Learn the effective methods to create website mockups. The website mockups can work wonders if they can be supported by the best user interfaces and the design process and style preferences of the designers. Though there are both advantages and disadvantages of the tools for mockup, the best reviews from the companies suggest the web designers to use them. Bespoke Tools: Various mockup tools like, UXPin, Mockups and Balsamiq can help you to go through the entire process of building mockups. The tools are so easy to use that you can concentrate only on the styles you need to provide. The experts in this sector can customize the styles according to their advanced needs. If you want to create some low fidelity designs by the wire-frames, the Mockups can be the right options for you. The UXPin offers built-in integration with a host of elements in its library. The activities may include drag, drop and other customization for creating your mockup. All the elements in the library are responsive in nature and can be used in both web and mobile. Its truly a great way to create a website. Learn the effective methods to create website mockups. The graphic design software like Sketch , Illustrator and Photoshop are widely used by the skilled designers. These platforms can maintain the pixel volume with the maximum visual fidelity. When you are working with the graphic design software, you have got an easy access to the high definition colors with all the preset schemes. Now, if you are working for a single brand with a specific color preference, you are definitely restricted to use only that color and nothing else. Besides color, there are other visual tools that allow you to manage the specific details of the site. But there are some dark sides of using this software. The design coding may be difficult for the translation. It may work well with the Photoshop but may not work properly with the codes. Therefore the elements like gradient effects, shadows and fonts may not be properly activated in the website mockups. So the software is only advised if the high fidelity visuals are present. If your page remains heavy with styles, it may wash out the specific details of the mockup process. The website mockups that are created in the Sketch or the Photoshop can easily be dragged and dropped in the UXPin interface. After that you can easily perform animation in all the layers with the help of few clicks. If you are a beginner in the coding process, you can definitely start with the HTML and then gradually move to the CSS. Minimize Waste: The mockups minimize wastes after producing the final product. It basically ends up with HTML or CSS and do not produce any wastage. Feasibility: If flash is used for creating mockups, it might appear attractive but may slow down the other functions. It may also be difficult for translating all the codes. Therefore simple codes with easy tools for changing the fonts and the gradients can be used. Fast Iteration: The mockup coding saves a large amount of time with a quick iteration process. But the beginners disagree that it takes time in dragging and dropping activities. Though there are various advantages in coding, there remain few limitations also. It restricts the creativity of the designers. Experimenting is also allowed up to a certain extent in this coding process. The overall design process can appear difficult if the designers are ready with multi tasking activities. As all the mockups are not similar, different decisions can be taken for coding, fidelity and the platforms. They will definitely provide with different results. 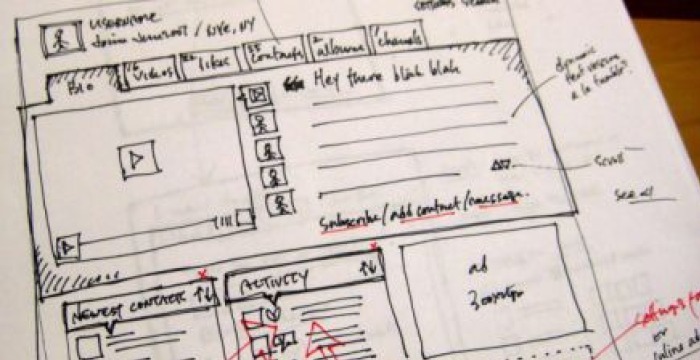 You need to be aware of the actual goal before moving forward for creating website mockups. Did you know that Easysite gives you all the tools you need to start your very own website. No coding knowledge required. You also get a free domain, web hosting, website builder and E-commerce software. If you are looking to learn how to create a website why not try Easysite.